-After lunch, cruise depart from Cai Be to Sa Dec via My Thuan, a nice and quiet town overlooking Mekong river. Up to river tide, stop en route to visit brickyard handricraft villages a long the Mekong River. -After breakfast, start excursion to visit Sa Dec town where Marguerite Duras&#39;s famous novel Lover was set and made famous by the film L’Amant, the Marguerite Duras story and explore this town. -Visit a local garden by walking or biking along the village path and get yourself acquaintance with rural activities as farmers farm their fields &amp; orchards. 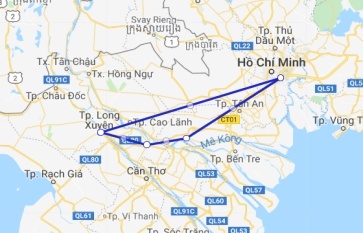 -Cruise continue to Long Xuyen. 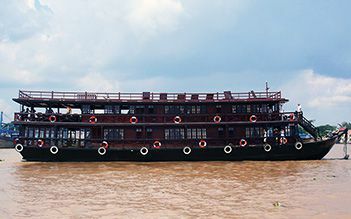 Leisurely cruise up the Mekong River while enyoying the beautiful scenery and the aperitifs and sunset cruise. -Dinner and nite on board in Long Xuyen. -In the morning, the noise of the floating market wake you up, visit the daily life of the local people who live on both sides of the Mekong river breakfast on board, then our small boat pick up and boat trip to explore Long Xuyen floating markets and floating villages for colors, smells and tastes, and they gather together countryside people for sharing goods and news from families living often in remote places: an authentic Vietnamese culture experience. -Continue boat trip to Ong Ho island (Cu Lao Ong Ho - Museum of the 2 nd President of the Vietnam), bike ride on the footpaths of the countryside of Ong Ho island to discover tropical fruit orchards and local people&#39;s activities and the small arroyos on the island. 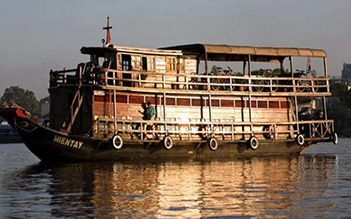 Visit the daily life of the local people who live on both sides of the Mekong river. -Check out, disembark and return to vehicle at Long Xuyen pier. Having lunch (up to river tide and according to the availibility of Mien Tay boat, clients will have lunch at restaurant or on board). After lunch, drive back to Saigon. End tour. A perfect organization, plenty of space on the boat, we were only six, an excellent, freshly prepared food and Say a sympathetic, competent guide made the tour a great experience. Despite the not cheap price, we can highly recommend the tour. My friend told me: “ If you want to know about the riverside life you should visit Mekong delta in Vietnam. And there is a town like little Vernice with numerous narrow canals” It made me curious. So when I had free time I came there. It was so exciting to experience the little “Vernice” – Sa Dec town. I also had good chance to see the coconut factory, wrapped the delicious coconut candy in other town but I don’t remember name. It is too difficult to remember Vietnamese name. People living along the riverside were so warm and nice. They all smiled and waved our group whenever they realized us there. One more unforgettable thing was touching the big python and tasting snake meat with 7 ways of cooking. Yummy! I was so lucky to travel with this travel agent`s support. I like the organization way, very professional, promptly reacted to my require and very safe to pay online. Recommendable!